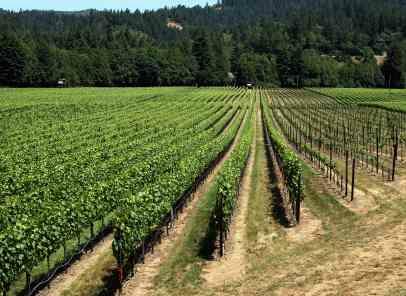 Some of the juiciest Pinot Noir and most voluptuous Chardonnay coming out of Sonoma County are Russian River Valley wines. This AVA (American Viticulture Area) runs from the border of Mendocino County in the north of the county near the town of Healdsburg, then towards the east perimeter to Guerneville, and then meanders south towards the funky town of Occidental to Sebastopol and then circles round just east of Santa Rosa before going north to close the loop. Within this viticulture appellation lump are two sub-AVAs, Green Valley and Chalk Hill. Green Valley is surrounded by the Russian River Valley, whereas Chalk Hill lies east of Highway 101 just north of Santa Rosa. The northern California wine region is relatively new, having been ignored by winegrowers until the 1980's when a few intrepid souls, seeing the magic dust that the coastal cool climate offers, began planting vines and successfully making wine. Over the ensuing two decades, the numbers of wineries and vineyard acreage has grown to over 100 wineries with approximately 15,000 acres of planted vines. The region is defined by geology and climate-the Russian River, San Andreas Fault, volcanoes, sun, and fog. The shaky San Andreas Fault that separates two teutonic plates that have pushed up the mountains in the western part of the region acts as a buffer to the Pacific. The river, which carves out the Russian River Valley, starts just north of Healdsburg, snakes south for a few miles and then hangs a sharp right and heads towards the Pacific Ocean. The ancient volcanoes in the area deposited deep layers of volcanic ash that eroded over time and left a variety of sandy loam, clay, and alluvial gravel spread over the area. In the wake, Russian River's confluence is left a rich loamy soil that drains well and helps define the character and variance of the region's grapes. The last influential forces are Pacific fog and warming California sun. Due to its close proximity to the cool Pacific, spooky fingers of fog creeping through the river's tributaries blanket all its nooks and crannies. Usually by mid-morning the mists have burned off from the sun and the temperatures rise to heat up the rest of the day. That is until the early evening when things start to cool down again. The cooling effect of the region's maritime fog shapes the character of Russian River Valley wines and separates the region from all others in California. While it is true that most of the common grape varietals popular in California are grown in the Russian River Valley wine region, there are really only two that are eponymous and overtly reflect its terroir, Pinot Noir and Chardonnay. By nature this moody, schizoid grape is difficult to grow-and outside of Burgundy there are but a piddling few spots in the world where the grape's magnificence emerges. You can count the Russian River Valley as one. Here the Pinot Noir tends to be fruit-driven with wild strawberry, raspberry, and cherry flavors. Tack on tea, smoke, meaty bacon with silky velvet, richness, and bright acidity and these complex Pinot Noirs shine through the Russian River fog. In California, Chardonnay is much maligned, vilified…and still popular. However, a lot of that reputation has been earned through a pandemic overwrought style loaded with malolactic butter and oaky vanilla. The style from Russian River Valley tends to favor the Old World style of Chablis and Burgundy. Wines from here will usually deliver a mouthful of stone-fruit flavors, pears, apples, and the tang of lemon. They are rich, succulent, aromatic, and more balanced than other warmer California regions. Cabernet Sauvignon and Merlot are grown here but to a lesser degree. Cab leans to softer versions than Napa Cabs and Merlot is grown here mostly for blending. Zinfandel and Syrah are a different story. There are some noteworthy Zinfandels produced in some of the hillside vineyards. Syrah is popping up more often on some producer's wine lists now and the region's cooler climate produces dark and inky wines that have more in common with a Northern Rhône than an Australian Shiraz. There are a lot of treats to discover here. It's also a great alternative destination to the standard Napa Valley wine country trip. Here's a condensed list of some of my favorite Russian River Valley Wines that possess more than a few redeeming qualities. This is not a quintessential list as there are plenty more to consider besides mine. If planning a visit, note that many wineries are not open to the public or may require appointments so it's best to check ahead to avoid disappointment. DuMOL is a boutique winery that crafts concentrated Pinot Noirs and Syrahs in Burgundian and Rhône style. Their reputation is on the rise. Critics love Farrell's wines and his passion for Pinot Noir. Who am I to disagree? The winery is outside of Healdsburg on a hill with a great view of the valley. One of my favorite wineries and it's always a pleasure to spend a leisurely afternoon in their tasting room. The small family-owned winery produces single vineyard Pinot Noir and Chardonnay under the Hartford Court label and old-vine Zinfandels under the Hartford label. Their Arrendell Pinot Noir is from a vineyard in the coldest spot in the Green Valley sub-appellation. More often than not it's special. Widely-acclaimed as one of the best Sparkling Wine around. For those people that always rant, "ABC-Anything but Chardonnay'', give them a glass of Kistler and tell them to put a cork in it. Sorry, no visitation rights here. Kosta Browne's Pinot Noir regularly makes it to the top of many critics list. Unfortunately, about the only place to find them are in select restaurants or hiding in a friend's cellar who somehow finagled his way onto their mailing list. Home of the Jackass Vineyard Zinfandel and a landmark family winery. Stop in for a visit. Award-winning Pinot Noirs and Zinfandels from Russian River Valley and the Sonoma Coast. Paul is all over the world wine map but he's also in Sebastopol. Love their label, love their wines. Pinot lovers only need apply. An institution in the Russian River Valley for two decades with their highly prized Pinot Noir and Zinfandels.